Printing is craftwork. The printing machines used at Carta Mundi were Heidelberg presses; huge constructs the size of a room. Card images were submitted on film and then deconstructed by hand before being etched - separated by two layers and four colors - into a printing plate. Colors were added and dried one at a time, and even things like the weather could affect the ink and how the card turned out. You had to think about a lot of things to create a high-quality product. Dot-gain, bubble spots, typesetting, layout and how to apply the varnish finishing to mention a few. Like with any art, you really want to do a proper rehearsal before releasing your product to the general market. Craftspeople in the printing industry commonly create something called a "proof" as a color reference guide for adjusting the press before the final press run. The primary goal of proofing is to serve as a tool for customer verification that the entire job is accurate. 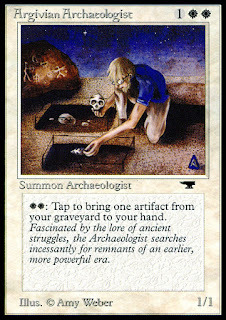 It is no secret that Argivian Archaeologist is the greatest white Magic card ever printed. 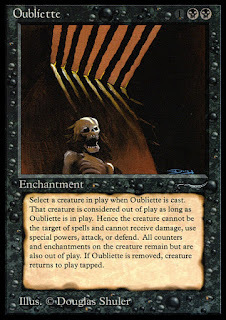 It was the most expensive mono-white card in 1994, the era of weird brokeness if there ever was one. Back in the days, one of these nerds held a price tag of two Mishra's Workshop, or a small handful Bazaar of Baghdad. As noted by the flavor text, the archaeologist searched incessantly for remnants of an earlier, more powerful era. It is amusing that the cards he dug for in 1994 are starting to resemble real antiquities these days. Relics from a very different time, before the era of the web, streaming and smart phones. Hell, three years before it saw print there was a Soviet Union. 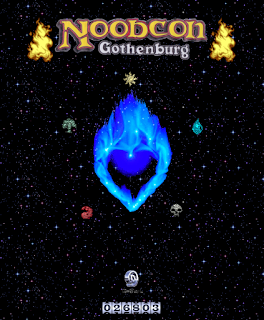 Its release date is about as far away from today as it is from the Moon landing. Life imitates art. Playing the waiting game somewhere in one of the largest airports in the world. I was here three hours early and did not bring a laptop for this trip. When was the last time I offered myself the opportunity to be bored? It's odd. I remember things that I forgot, and I wonder what things I've forgotten that I forgot. I often find myself living rapidly in the present, a lot in the future, and too little in the past. The past shaped me, and I don't want to forget too much. Which countries border Honduras? What element has atomic number 84? I don't know, but I knew a year ago. How many memories from this journey will eventually stick? Will the new things keep pushing away the old? Is that why the days seem to grow shorter as I grow older, because I don't focus enough on the present to remember it? Damn, being stuck with just thoughts is weird. It was a long time ago since last. Maybe I should hang out at airports more often. Clear the head or something.